KANU'S TRIAL...TODAY, 26th SEPTEMBER 2016 IS ANOTHER DAY. 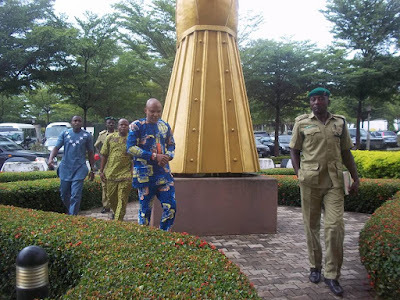 The Prisoner of Conscience Nnamdi Kanu who is also the leader of the Indigenous People of Biafra being held extra-judicially in an Abuja prison amidst previous court pronouncements for his release will be appearing before the Federal High Court sitting in Abuja alongside two other defendants today. IPOB had previously called for the removal and withdrawal of John Tsoho from presiding over the trial proceedings of Nnamdi Kanu and two others because of the glaring evidence and indications that he might have been compromised. The formidable and well cultured BIAFRA WRITERS that often give millions of Biafrans and friends of Biafra all over the world undiluted and unadulterated report about Nnamdi Kanu, IPOB and happenings in Biafraland and in the Diaspora will once again stand in to bring to you every bit of court updates LIVE and DIRECT as they unfold. Anyikwa Kelechi Cynthia and Meruonna Chukwuemeka reporting LIVE from Abuja. (PRAYER IS MY CONTRIBUTION ) while I was praying for Nnamdi kanu, this is the message the LORD OF HOST, THE I AM THAT I AM , THE LORD STRONG AND MIGHTY ONE, THE LION OF THE TRIBE OF JUDAH , THE MIGHTY ONE IN BATTLE GAVE ME CONCERNING HIM , THAT HE SHOULD MEDITATE MORNING, AFTERNOON AND EVENING ON THESE SCRIPTURES. PLEASE FORWARD THIS MESSAGE TO HIM. ASSURED HIM THAT WE ARE PRAYING FOR HIM, THAT THE LORD IS WITH HIM AND HE WILL SEE BIAFRA ALIVE NOT DEAD IN JESUS SOVEREIGN AND FAITHFUL NAME I PRAY AMEN. Romans 8:31 What shall we then say to these things? If God be for us, who can be against us? 8:33 Who shall lay any thing to the charge of God's elect? It is God that justifieth. Hebrews 11:32 And what shall I more say? for the time would fail me to tell of Gedeon, and of Barak, and of Samson, and of Jephthae; of David also, and Samuel, and of the prophets: 11:33 Who through faith subdued kingdoms, wrought righteousness, obtained promises, stopped the mouths of lions, 11:34 Quenched the violence of fire, escaped the edge of the sword, out of weakness were made strong, waxed valiant in fight, turned to flight the armies of the aliens. TO ALL MY BIAFRANS BROTHERS AND SISTERS, LET US ALL PUT OUR TRUST IN GOD, PRAY FOR THE FREEDOM OF NNAMDI KANU,OTHER BIAFRANS UNDER DETENTIONS AND FOR THE RESTORATION OF BIAFRA NATION. THE LORD WILL GRANT US OUR FREEDOM THAT HIS NAME ALONE WILL BE GLORIFY. GOD BLESS AND STRENGTHEN ALL OF YOU THAT ARE WORKING TIRELESSLY TOWARDS THIS GOAL. Let us not be like Esau who for fear of death and because of meal sold his birthright to Jacob , which he later regret for a lifetime. at this time we don't only need strength but we need more of wisdom and prayers to bring this restoration of biafra to pass.